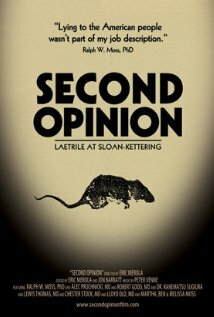 There are many lessons to be drawn from SECOND OPINION: LAETRILE AT SLOAN-KETTERING, not the least of which is that science and money make for an uneasy relationship. There are few better examples of this than the case examined in Eric Merola’s documentary about the education of Dr. Ralph Moss at Sloan-Kettering. A classicist by profession, and newly hired as a public affairs officer, Moss’s first days at Sloan involved a scandal about fudged experimental data, and continued through his association with Dr. Kanematsu Sugiura, a respected researcher whose findings about Laetrile were at odds with what the Institute, for reasons of its own, wanted him to find. What Moss discovered was that although Laetrile was not a cure, it was a valuable palliative, stopping the progress of tumors, and offering significant pain relief. Instead of pursuing that line of research, Sloan-Kettering shut it down, virtually changing its position on the drug overnight, and giving Laetrile the bad reputation that is has had to this day. We went on discuss how Dr. Moss decided to counter the misinformation being disseminated about Laetrile while still working at Sloan-Kettering, the serendipity the and determination involved in bringing the filmmaker and the whistleblower together, the price Dr. Moss and his family paid for taking his stand, and to make a point about the drug treatment in question, why Laetrile was banned by the FDA decades before the controversy, and the comparative mortality rates between Laetrile and aspirin. The most striking statement in the interview, and one that sums up so much of what is wrong with the health care system in America is what Dr. Moss had to say about Laetrile, which is that it was, and is, too cheap for its own good. This is why Merola and Moss don’t want their documentary to just be a movie, they want it to be a movement, and with the weight of evidence, and new research to back their assertions about Laetrile, it might just happen. The shocking disclosures behind Laetrile’s discrediting as a cancer treatment by the powers that be, and without a creditable peer review is nothing short of a wake-up call to action. SECOND OPINION: LAETRILE AT SLOAN-KETTERING, is tale of ego, politics, and why scientific research is not as pure as we might think. In the 1970s, Laetrile, also known as amygdalin was touted as a cure for cancer, despite having been banned in the United States. Undeterred, people flocked to Mexico in order to be treated with Laetrile in the hopes of prolonging their lives. This was to become central to Dr. Moss’ time at Sloan-Kettering. Because the institute had become embroiled in the ci-mentioned scandal, the specifics of which involved a researcher fudging his data with a magic marker of all things. Sloan-Kettering was on guard against a similar event happening again, which is how Moss found himself being asked to spy on Dr. Seguira, the one researcher at Sloan-Kettering who was working on Laetrile and finding it to be promising, which was not what the Institute wanted to hear. Moss’s journey of discovery through the labyrinthine machinations that prevented facts from being revealed makes for a medical thriller of a documentary, and an inspiring story of a man who chose to follow his conscience despite the consequences. He has since gone on to become a successful author whose books include QUESTIONING CHEMOTHERAPY and FREE RADICAL, and is the creator of THE MOSS REPORT ON THE TREATMENT OF CANCERS devoted to alternative and complementary treatments, found on the web at CANCERDECISIONS.COM,. Merola’s previous work includes BURZYNSKI, and BURZINSKI: CANCER IS SERIOUS BUSINESS, PART II.